The Hawker Fury was designed to a RAF requirement for a ‘light Tempest’, which they had found to be very effective as a ground attack aircraft. A lighter version, it was argued, would make a good fighter. 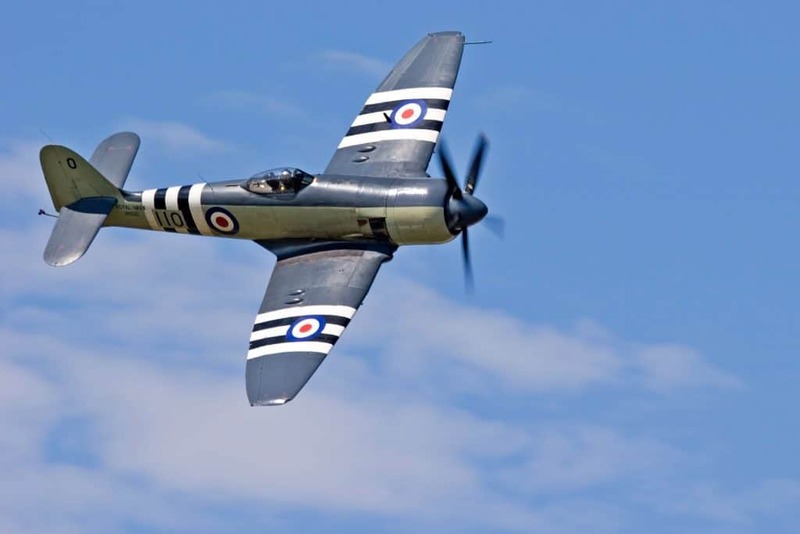 The Fury was built in the same general arrangement as the Hawker Tempest but with a reduced wingspan and with the Tempest II’s Bristol Centaurus engine, the first production aircraft flying in 1946. However, with the end of the Second World War, the RAF decided that they would not proceed with this aircraft in favour of waiting to re-equip with jets. At that time the Royal Navy felt that the operation of jet aircraft from ships flight decks was still something of an unknown quantity and instead specified a Naval variant of the Fury. Re-designed with a strong point for a catapult strop, an arrester hook, folding wings and high energy absorption undercarriage the Sea Fury entered Naval service in 1947 as the Sea Fury F.10 (Fighters). Like many aircraft of the day it could employ Rocket Assisted Take Off Gear to help a heavily laden aircraft achieve flying speed from the restricted length of a flight deck. The Sea Fury was the Fleet Air Arm’s last piston-engined fighter to serve in front-line Squadrons. The prototype Sea Fury first flew on 21 February 1945 and carried out deck landing trials in HMS Ocean in October of that year. The first production aircraft (Mk.F.10) flew on 15 August 1946 and the first Squadron, No.807 Naval Air Squadron (NAS), re-equipped with F.10s at the Royal Naval Air Station Culdrose in late 1947. The first Squadron to fly with the FB.11 variant, 802 NAS, re-formed in May 1948. In all, fifty Sea Fury F.10s were built, followed by 615 Sea Fury FB.11s (Fighter Bombers), the last of which came off the production line in November 1952. A 2-seat weapons trainer variant, the T.20, was also produced with the prototype flying in January 1948. Quite apart from the obvious addition of the rear cockpit fitted with duplicated controls, the T.20 differed from its F.10 and FB.11 brethren in a number of ways: not being intended for carrier operations the arrester hook was removed, as was the retractable tailwheel unit – presumably the removal of the associated hydraulic jacks and piping going some way to help redress the centre of gravity issue caused by adding the second cockpit. Training for carrier landings were carried out at Culdrose and often at nearby Predannack in what were termed Aerodrome Dummy Deck Landings (ADDLs) prior to aircrew getting to try the real thing. Mounted between the front and rear cockpits a tripod periscope arrangement developed by Hawker enabled the instructor in the rear cockpit to see what the student in the front seat was viewing through his gyro gunsight. This was probably all the instructor could see as those who have flown in the back seat will probably testify that visibility is, to say the least, dire! Two of the Hispano Mk.5 20mm canon were deleted from the centre mainplanes in order to provide additional space to house equipment displaced from the fuselage by the addition of the rear cockpit. A total of 60 of these aircraft were built. 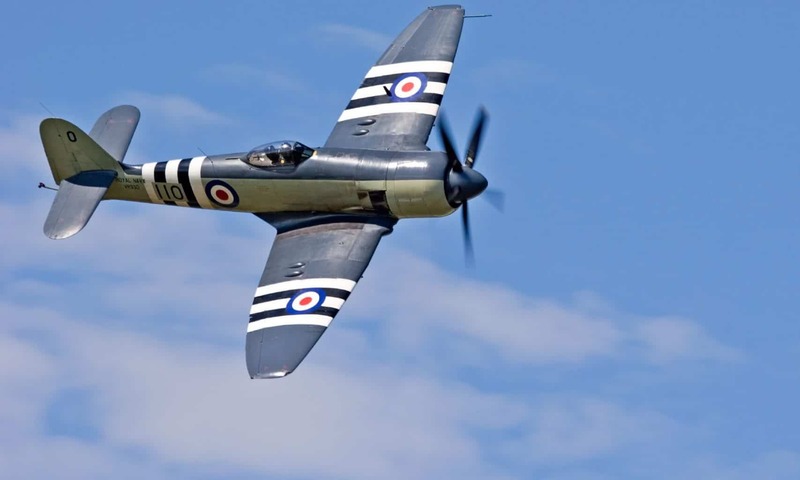 When the Korean War broke out in 1950, the Sea Fury was the Fleet Air Arm’s leading single-seat fighter, and it fought with great distinction during the conflict. The Sea Fury squadrons involved in Korea were 802 NAS (HMS Ocean), 807 NAS (HMS Theseus), 801 NAS and 804 NAS (HMS Glory) and 805 NAS and 808 NAS (HMAS Sydney). 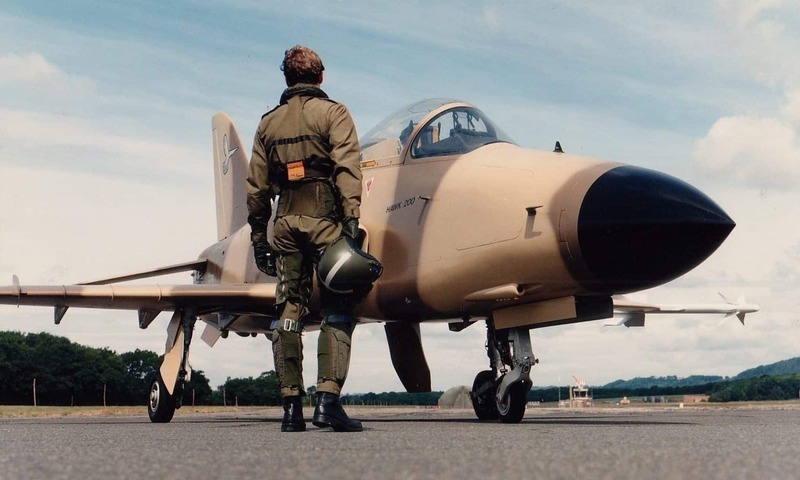 The aircraft were used in the ground attack role armed with bombs and rockets and were also engaged in air-to-air combat with the much faster MiG-15. On 9 August 1952 a Flight of Sea Furies from 802 NAS flown by Lieutenants Carmichael and Davis, and Sub-Lieutenants Haines and Ellis, were on an armed reconnaissance flight in an area just North of Chinimpo when they were attacked by eight enemy MiG-15s. Despite the enemy’s superiority in numbers and a 200 mph speed advantage, the Sea Fury pilots shot down one MiG and badly damaged two others without incurring serious damage to their own aircraft. As Flight leader, Lieutenant Carmichael was officially accredited with the ‘kill’ and was subsequently awarded the DSC for his heroism, but all of the other pilots officially claimed their quarter share. With the advent of the introduction into Fleet Air Arm service of jet aircraft such as the Sea Hawk, the Sea Fury was relegated to second-line duties, with many being employed by the Air Branch of the Royal Naval Volunteer Reserve (RNVR). After the axing of the RNVR units in 1957 the majority of Sea Furies were scrapped. Happily a handful survived to see service with the civilian-run Fleet Requirements Unit, used as ‘flying targets’ for the training of Royal Navy ship crews, until finally being retired in 1962 – the final piston-engined, fighter-type aircraft to see service in Royal Navy markings. When he returned to his aircraft the propellor had already been removed.